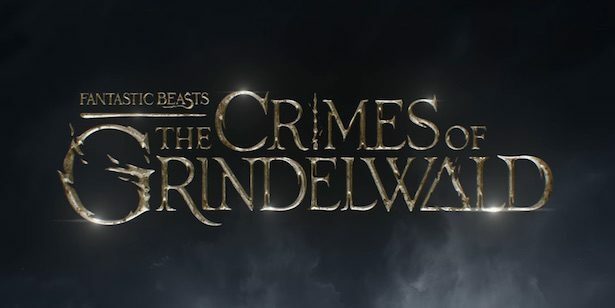 When Warner Bros. announced they’d be giving us the first teaser for Fantastic Beasts: The Crimes of Grindelwald, we figured we’d be getting a brief look at the movie. It turned out we were more Ron and less Hermione on that prediction, because what we got was a full trailer showing way more, from familiar and never-before-seen places in the wizarding world, to newcomers and returning characters, to a growing threat that will force everyone to choose a side in the coming war. But for everything we saw, it was hard not to notice which key character barely showed up at all, and that might tell us something far more important than anything in the movie. The trailer opens with sweeping shots of the most famous locale from Harry Potter, Hogwarts. It turns out has always looked absolutely beautiful. We then see government officials apparate outside the school, where curious students look on. This shot has the potential to contain some great Easter eggs if we ever learn some of these kids are famous adults we know from Harry Potter. The serious looking government officials have come to the school with “some questions” for Jude Law‘s young(er) Dumbledore, who at this time was still a Transfiguration professor. When the first photos from the film were released we thought these might be members of MACUSA, who let Grindelwald escape, but the man speaking appears to have a Scottish accent. It doesn’t mean the entire delegation we see here is entirely made up of people from the Ministry of Magic, since Grindelwald poses a worldwide threat, but it does show Newt is a going concern for wizarding officials on at least two continents. And also that Dumbledore was always a troublemaker. Knowing what we know about him and how he is usually three steps ahead of most people, Dumbledore’s “this is a surprise” response means it is almost certainly not. They want to know why Newt is rumored to be going to Paris, which is seemingly confirmed by Newt piecing back together a torn up postcard from there. Later in the trailer we’ll see an important character from the first film is now living there. While we hear an official talking to Dumbledore about Newt, we see someone in the shadows pulling the light from street lamps. Whoever it is, they appear to be using a Deluminator, just like the one Dumbledore will one day leave to Ron Weasley in his will. Could it be the exact same one? Dumbledore did invent it after all. Of course, no matter how coy Dumbledore is about whether or not Newt is working for him, we know he is, because we see Newt trying to secretly meet Dumbledore high above the streets of London. This next shot doesn’t reveal much, but this look Dumbledore gives at the end of his line about teaching Newt is our favorite part of the trailer, especially because it shows just how perfect Law might be in the role. Dumbledore then spells out what will likely be the major conflict for almost every character in the movie with, “The time is coming Newt, when you’re going to have to pick a side.” We then see the first of only two images of Johnny Depp’s Dark Wizard Grindelwald (more on him later). Standing next to him is Vinda Rosier, one of Grindelwald’s most loyal followers. They stand before a huge group, likely the wizards and witches who are aligning with him. Next we get a look at Katherine Waterston’s Tina Goldstein, who now sports a much more stylish haircut and coat. This is not the meek Tina we knew in the first movie. That’s followed by shots of Newt with our favorite No-Maj, Dan Fogler’s Jacob Kowalski. He accompanies Newt to what looks like an underground hiding spot for Newt and many of his fantastic beasts. Remember them? You know, the creatures from the title of the franchise. The next shot might be the most important one in the entire trailer. It shows Ezra Miller‘s Credence sitting on a roof with newcomer Claudia Kim who plays Maledictus, the main attraction at a French magical circus who is “the carrier of a blood curse that destines her ultimately to transform into a beast.” (Learn more about her and who–or what–she might become one day here.) Credence appears to be showing her his Obscurus; it’s emanating from his hand. If this means he can now control it, he might arguably be the most powerful wizard in the entire world–maybe ever (read more about Obscurials). We saw the kind of destruction he wrought when he snapped in the first film. What can he do if he can harness it? There would be no greater ally in the coming war, which might be why Newt is heading to Paris–to find him. Imagine if Newt and his magizoologist skills could save Maledictus, who Credence seems to be close to, from her terrible fate. Next we see Tina’s sister Goldie inside a massive office with a glass-domed ceiling. It’s not clear exactly where she is, but the ceiling is decorated with images and names of fantastic beasts. Our best guess? This is the Department for the Regulation and Control of Magical Creatures. We then briefly see Leta LeStrange played by Zoë Kravitz, who we only saw in a photo in the first movie when we learned her and Newt have some kind of troubled past. She’s at some kind of fancy party, though her fiance Theseus, Newt’s brother, is nowhere to be found. Considering her surname, we’re wary of which side she will ultimately choose. Is this Newt riding a what looks to be the mythical hippocampus? The next shot is one of the trailer’s most mysterious. Dumbledore stands in what looks to be Newt’s secret lair, staring at glowing drawings that include illegible writing and masks. And we get our first glimpse at the Circus Arcanus Credence has run off with. After a shot of Newt catching his favorite Bowtruckle, we see something truly terrifying: an angry Credence. How angry? “Credence smash” angry. We have no idea who these two masked men in a chariot are, but we’re always happy to see thestrals, the magical world’s best, most misunderstood animals. Only then do we get our only look at Johnny Depp’s face as Grindelwald. His hair is long and ragged, showing considerable time has passed since the last movie when it was short. He is pale, drawn, and under guard from two wands. We know he escapes early in the movie, so this could be the opening scene. We’re going to come back to this…. 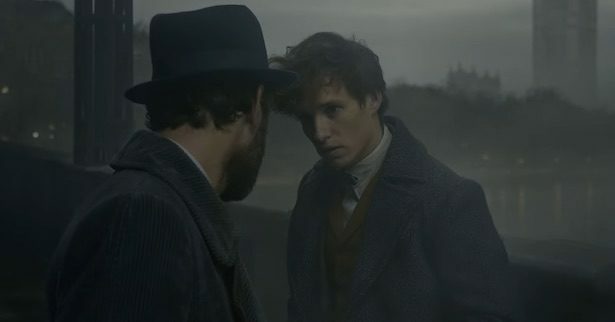 While we see Grindelwald, we hear Dumbledore say to Newt, “I can’t move against Grindelwald. It has to be you.” We know Dumbledore was reluctant to face his former friend for years, a decision which will clearly put Newt and others in danger as they fight for him. This meeting in the rain at street level takes place after the one we saw at the start of the trailer. Have the crimes of Grindelwald caused more push back on Dumbledore to actually do something, hence his statement to Newt here? We then finally meet Newt’s brother Theseus, played by Callum Turner, as the two brothers stand together against some enemy, creating an amazing wall of fire. Considering the official synopsis for the movie says, “Lines are drawn as love and loyalty are tested, even among the truest friends and family, in an increasingly divided wizarding world,” this has us feeling a whole lot better about the brothers being on the same side together. The last shot is a smoky haze that shows that even though these are prequels, the Deathly Hallows still hang over everything. Like we said, way more than we were expecting. But all of it makes one aspect of this trailer stick out even more. This is the official title for the movie. Why did we barely see the character whose name is in the title? And why do we have almost no idea what his crimes are in a trailer that showed so much? There’s the possibility Warner Bros. is saving them for the next trailer, sure. However, it’s hard not to watch this and think it’s a way to specifically keep us from focusing on the controversy surrounding Johnny Depp–who has been accused of domestic violence by his ex-wife Amber Heard–and his continued involvement in the franchise. J.K. Rowling recently put out a vague statement supporting him, but it raised more questions than it answered. But if they think hiding him and his character from the movie’s promotion is going to make us forget about the accusations and the lack of transparency from the studio about why they feel he should continue in the role, that’s not going to work. You can’t have him in your movie, call it The Crimes of Grindelwald, put him front and center, and think we’re going to forget about the alleged real-life crimes of the guy playing him. We’re thrilled we got a lot more here than we were expecting, but we expect better from Warner Bros.
What do you think of this trailer? What does it tell us about the movie? Talk to us about anything and everything in the comments below.